It is Citrus Season here in Southern California. We are blessed with free lemons, limes and oranges this time of year. There is nothing better than fresh squeezed Orange juice. Yum. One of my favorite flavors is the combination of Orange and Vanilla. At Jamba juice I order the Orange Dream Machine. This drink tastes just like it... but with some alcohol added. I love handing a cocktail to my husband when he comes home from a long day of work. Just enough to relax him and make him feel at home. 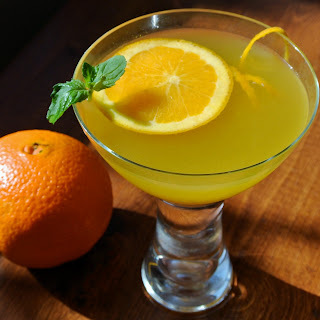 This cocktail tastes like orange sherbet with a touch of vanilla and cream. I hope you enjoy this cocktail as much as we do! Have confidence in yourself and believe in yourself. Tell yourself over and over again, "I am a hottie!" No matter whether you are short, tall, skinny, or heavyset, just look in the mirror and say to yourself that there is no one else in the world just like you. You are unique and fabulous - and now is the time to believe it! Remember, men are drawn to women who are cool and are self-assured. Be one of them. Fill a mixing cup with 1/2 way with ice. Shake all ingredients well and strain into a cocktail glass.